TNPSC Notification 2019 | Apply for 199 Group I & others - tnpsc.gov.in. TNPSC Notification 2019 | Apply Online for 199 Group 1 & other vacancies @ tnpsc.gov.in. TNPSC Notification 2019: Here is a piece of good news for the applicants who are residents of Tamilnadu. The Tamilnadu Public Service Commission is on board to recruit various candidates for multiple profiles for the year 2019-20. Most of the graduate from Tamilnadu dream to be laced in TNPSC. So, in order to turn their dream into reality, applicants must check the latest notification from TNPSC Recruitment 2019 from our page and apply for it on the date. Here on this page, applicants will get a complete picture of Tamilnadu PSC notifications with required details. Check it out now!! Knowing things about Organisational structure or details is one of the intelligent things before going to apply for the jobs in TNPSC Notification 2019. So, Let’s have a look on the below sections of this page to get complete info about the organization. The Tamilnadu Public Service Commission is a recruitment body of the entire state of Tamil Nadu. The board was set up by the Indian govt in 1923 for the purpose of to examine the salary details of Indian Civil Service and the possibility of transferring some of the duties to provincial services. As per the articles 316 to 319 of the Constitution of India, the board deal with the structure of state public service commissions. TNPSC is headed by a Chairman and other fourteen other members, all appointed by the Governor of Tamil Nadu, in accordance with the above provisions of the Constitution of India. The organization is responsible for all the recruitment process in the state. Mr.Dr. K. Arulmozhi, I.A.S. is the Chairman of the commission. As per the recent news the board equipped with a total of 400 staff. Hence, applicants can get further details of Tamilnadu PSC from the official site i.e, www.tnpsc.gov.in. Hence, Let’s have a glimpse of Various Job opportunities which will be held in TNPSC Recruitment 2019. As a candidate of TNPSC Jobs 2019, Applicant must know which are the Jobs are offering from the board & what will be the Job Criteria. Every month the Tamilnadu Public Service Commission will release many notifications for various job profiles. People who have done Intermediate, Graduation, Post Graduation or any Post Graduation in Science background will have a chance to get jobs in Tamilnadu Public Service Commission. We have updated all the job profiles which are offering by the board in recent days. Hence, Check out the details below. There are many vacancies are about to fill in different departments of TNPSC. The applicants who have passed in Graduation in various streams from any govt recognized institution or university can apply for TNPSC Vacancy 2019. Even people who did their HSSLC or HLSC from any recognized board can also make their future with Tamilnadu PSC Jobs. The Tamilnadu PSC Recruitment Board released Various vacancies for ASE posts under Contract & Permanent basis. However, Applicant can get all the Job description of TN PSC Recruitment in the below text of this page. Applicants who want to apply for Assistant Engineer position in TNPSC Notification 2019, Must have qualified in Applicant must have passed in B.E/B. Tech or Degree in relevant fields from any Govt recognized instituion or university can eligible to apply for this post. Candidates must be having the minimum age of 21 and a maximum of 32 years. Age relaxation will be provided to the candidates with special categories based on their reservation as per Tamilnadu PSC Notification 2019. Here we have shown to the applicant about the complete job description of Assist Agricultural Officer vacancy in commission. Those who want to apply for Assist Agricultural Officer Vacancies in TNPSC Recruitment 2019 can grab the details here. So, We advised to the candidates to make use of this article and apply for TNPSC Vacancy 2019. Those who want to apply for Lab Technician Vacancies in Tamilnadu Public Service Commission Recruitment 2019 Applicant should have a qualified Diploma in Agricultural with higher secondary from any govt recognized institution or university can eligible to apply for this post. Candidates must be having the minimum age of 18 and a maximum of 35 years. Age relaxation will be considered as per the rules of Tamilnadu PSC Recruitment Board. 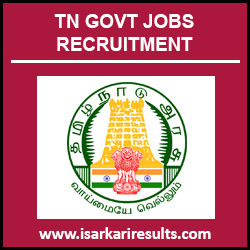 Why Isarkariresults.com for TN PSC Notification 2019? Now you may raise a question that, Why Isarkariresults.com for TNPSC Recruitment 2019? Why not others? Here is a solution for you. Here on this dedicated page, we will be listed a complete recruitment process along with Online Application form links. Apart from this, here you can get Syllabus, Previous Papers, Admit Cards & other details once it gets released from the officials of the Tamilnadu Public Service Commission under one roof. In Future, if you don’t want to miss any notification released from Tamilnadu PSC, Subscribe to our newsletter or be regular to our page. Hence, Applicants are advised to make use of this article and apply for TNPSC Notification 2019-20.